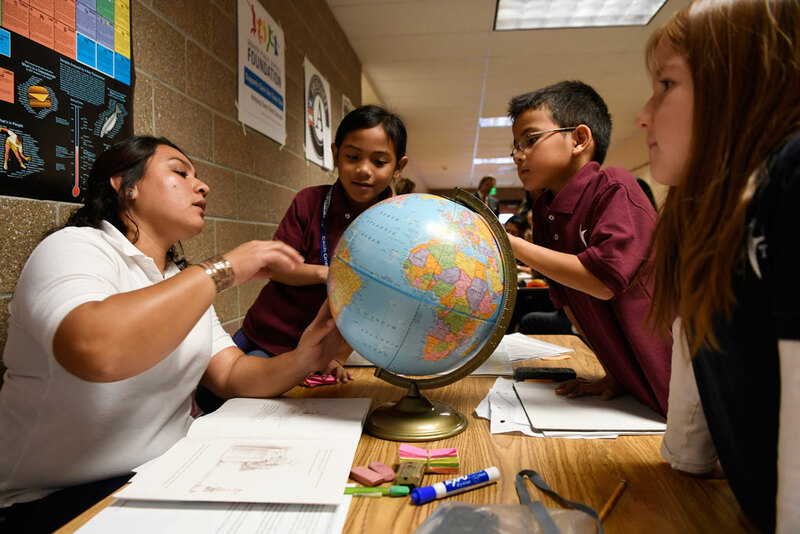 A parent tutor teaches geography to students at Greenwood Academy during Denver Public Schools' Each One Teach One program, November 2016. Denver Public Schools’ Tiered Support Framework is a boon for all district schools while helping those with the greatest needs outpace similar schools across the state. Federal school improvement policies, by design, have historically targeted the schools struggling the most. Under the No Child Left Behind Act (NCLB), states were required to identify and support chools that failed to meet benchmarks, which led to overclassification and thinly spread resources. Beginning in 2012, however, under the Obama administration’s waivers from NCLB, states instead have identified schools that performed in the lowest 5 to 15 percent statewide—a shifted focus to target resources that was driven in part by limited state capacity. The latest iteration of federal law maintains the requirement that states identify the lowest-performing schools, but now, districts will be responsible for intervening where schools need the most support. As a result, the Every Student Succeeds Act (ESSA) largely shifts the school support role from state to district hands. Importantly, states will continue to play a role in supporting schools that they have identified for improvement under ESSA. Yet, given districts’ local locus of control and prime positioning as change agents, they have greater capacity to create systems that support all schools.1 This broadening of district support, however, does not have to come at the expense of schools that are struggling to make gains. Rather, districts can create, implement, and sustain systems that help all schools—not just those at the bottom—to continuously improve. Denver Public Schools (DPS) provides a window into this work. As the largest school district in Colorado, DPS represents 10 percent of the state’s K-12 student population.2 The district uses a school rating system called the School Performance Framework (SPF) to inform its Tiered Support Framework (TSF), which categorizes all district-run schools into three levels of support: universal, strategic, and intensive.3 The universal tier includes foundational supports available to all schools, whereas school-specific improvement plans inform supports for schools in the strategic tier. Schools in the intensive tier receive district support for accelerated improvement and school redesign. Both the district’s school rating system and the TSF are unique to Denver, which leverages its district capacity to provide supports for all schools while ensuring that higher-need schools receive additional and differentiated supports and resources.4 Altogether, the district identifies, plans, supports, and monitors school performance in order to help all schools improve. In recent years, all DPS schools—including both higher- and lower-performing schools—showed greater growth than the rest of the state, particularly in math. When controlling for school demographics, students in DPS schools receiving more rigorous supports in the strategic or intensive tiers showed comparable gains in ELA and math relative to students in higher-performing DPS schools. DPS elementary schools receiving strategic or intensive tier supports showed greater schoolwide gains—in addition to greater gains for Hispanic students and students eligible for free or reduced-price lunch—as compared with similar schools in the state. When compared with peer schools, however, DPS elementary schools receiving strategic or intensive tier supports had larger achievement gaps between students who were and were not eligible for free or reduced-price lunch. Importantly, DPS’ Tiered Support Framework is not the extent of the district’s school improvement efforts. The district is using a variety of strategies to increase school quality and close opportunity gaps, including investing in early learning opportunities, expanding high-quality school options throughout the district, and developing strong pipelines for teacher leadership.5 The district’s gains therefore cannot be attributed to its tiered supports alone, but an analysis of the framework and school progress can provide a window into DPS’ efforts and outcomes. Accordingly, this report will explore how Denver’s school rating and improvement systems support school performance across the spectrum. 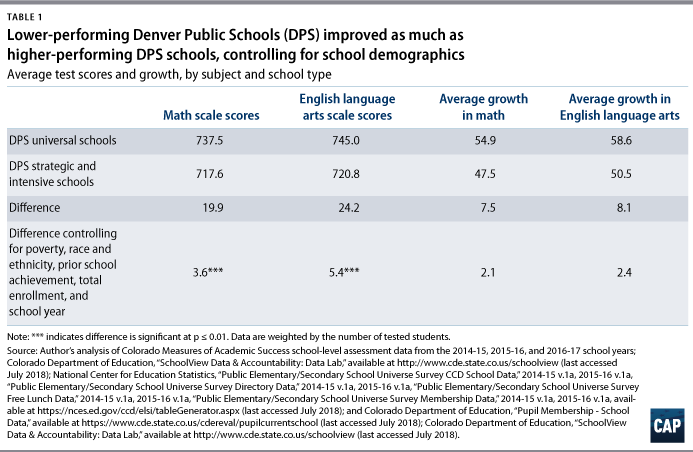 Although academic achievement is not the only barometer of school performance, the analysis in this report will use test scores and student growth as outcome measures, given the significant role these metrics play in Denver’s school rating system and the availability and simplicity of data.6 The results of this analysis suggest that other districts can learn important lessons from Denver’s approach to continuous improvement for all schools. Denver Public Schools has an accountability and support system that is unique to the district and aligns with the DPS vision of school quality. The district annually classifies all schools into five performance categories, which it uses to help determine which of the three tiers of supports each district-run school receives. DPS supports alternative schools—schools that serve large percentages of high-risk students or students with special needs—through a unique accountability, support, and funding structure and uses a separate tiering process for charter schools.7 As a result, alternative schools, charter schools, and their tiering processes are excluded from the analysis. Progress monitoring is also foundational to the district’s school support and accountability model. All schools, regardless of tier, have a regular review of their improvement plans with instructional superintendents, who supervise principals and provide accountability as well as school support; this occurs approximately every four to six weeks, alongside typical weekly visits. Schools in the intensive tier have more frequent school visits, and after three years of implementation and monitoring, the district evaluates if the highest-priority schools—those that implemented a whole-school redesign model—are on course to exit that tier after year five.22 Ultimately, schools remain in the intensive tier for a minimum of five years so that the district can provide ongoing support for schools to make and sustain gains; however, schools may receive longer support or intervention if improvement goals are not met. Approximately 1,400 Colorado schools—about 120 of which are in Denver—are included in the analysis, excluding charter schools and alternative schools.24 On average, excluding Denver, Colorado schools represented 45 percent free or reduced-price lunch-eligible students, 31 percent Hispanic students, 59 percent white students, and 3 percent black students. Meanwhile, Denver schools represented 69 percent students eligible for free or reduced-price lunch, 56 percent Hispanic students, 25 percent white students, and 12 percent black students. As part of the CMAS assessments, students in third grade through ninth grade take the Partnership for the Assessment of Readiness for College and Careers (PARCC) exam in ELA and math; they also take CMAS exams once in social studies during elementary and middle school and once in science during elementary, middle, and high school.25 This analysis is restricted to school-level ELA and math scale scores—which measure student performance at a point in time—as well as ELA and math growth scores, which measure student improvement over time. Since growth scores capture academic progress, they are important for determining school effectiveness, particularly for districts that serve more disadvantaged students and have lower scale scores. To better understand how Denver supports school progress, schools can be analyzed through the lens of the district’s Tiered Support Framework, which organizes resources by the three tiers of support based on school need. DPS created the TSF in the 2012-13 school year in order to support both the district’s highest-needs schools and those in need of preventative support, in addition to schools that were on track for success. In the 2014-15 school year, DPS amended its policy so that schools identified for intensive support would remain in that tier for five years, regardless of improvements in performance. This policy was applied for the first time during TSF identification in the fall of 2015. As examined above, in the 2015-16 and 2016-17 school years, DPS schools were associated with greater growth than the rest of the state. In order to understand which schools are driving this growth, one can unpack DPS’ academic outcomes by the district’s lower- and higher-performing schools through the lens of the TSF. Accordingly, this analysis will make a distinction between DPS schools that have and have not been classified in either of the more rigorous strategic or intensive support tiers over time. Out of the 122 DPS schools included in the analysis, 52 were in the strategic or intensive tier at least once between the 2012-13 and 2016-17 school years. These schools will be referred to as the “strategic and intensive schools.” During this same period, the remaining 70 DPS schools were exclusively in the universal tier and will thus be referred to as the “universal schools.” Charter schools and alternative education campuses are excluded from the analysis because they have separate district support systems. On average, the strategic and intensive schools included in the analysis represented 87 percent free or reduced-price lunch-eligible students, 71 percent Hispanic students, 15 percent black students, and 9 percent white students. Compared with universal schools, the strategic and intensive schools had significantly higher rates of poverty, greater shares of Hispanic and black students, and fewer white students. Another way to understand the effectiveness of DPS’ support framework is to compare the growth of the strategic and intensive schools with the growth of similar schools across other districts. Accordingly, the following analysis will examine how performance varies across similar schools, distinguishing between those that do and do not receive TSF resources. 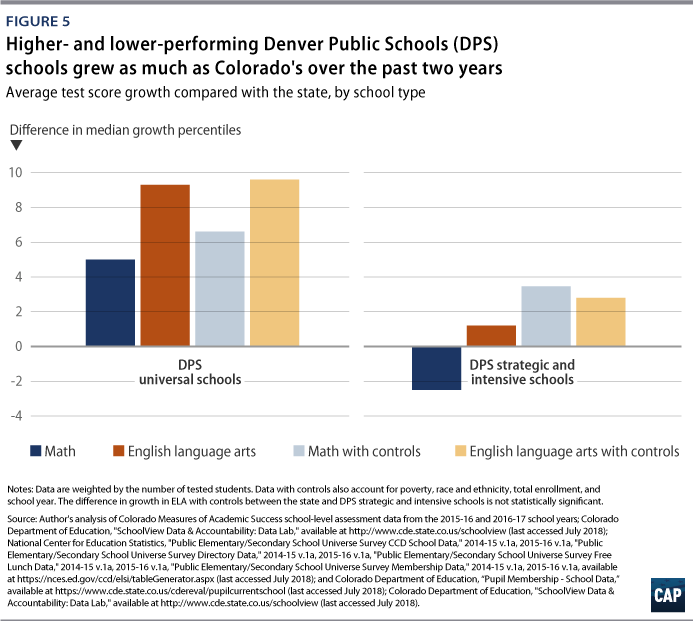 During the 2011-12 school year, the schools across Colorado identified for comparison had similar math and ELA achievement and demographics as the strategic and intensive schools. This analysis creates the peer group using 2011-12 data in order to identify comparison schools during the year prior to when DPS implemented the TSF. Ideally, then, differences between the two groups will be suggestive—at least in part—of the relationship between DPS’ support framework and student outcomes. Schools in this section of the analysis will be restricted to those with six years of data from the 2011-12 school year through the 2016-17 school year. Since three-quarters of the strategic and intensive schools with six years of data available are elementary schools, this section will exclusively explore the performance of elementary schools.37 As a result, the following analyses compare 35 strategic and intensive schools with a peer group of 117 schools across 30 Colorado districts. Using data from the 2014-15, 2015-16, and 2016-17 school years, Table 2, below, describes the two groups of schools. Both groups are close matches in achievement, poverty level, and percent of Hispanic students. However, because Colorado schools had significantly more white students and fewer black students than DPS over these three years, the group of peer schools in Colorado similarly had more white students and fewer black students than the strategic and intensive schools. 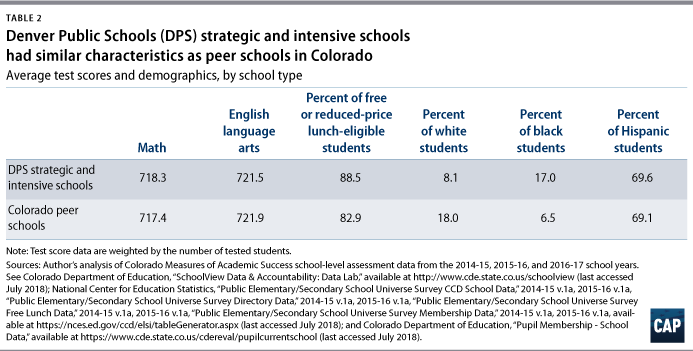 However, when compared with the Colorado peer schools, strategic and intensive schools were associated with larger achievement gaps between students who were and were not eligible for free or reduced-price lunch: 9.9 points in math and 11 points in ELA.44 (see Figure 6 below) Notably, this gap analysis is limited to schools that reported test score data disaggregated by both groups of students, which accounted for about half of the strategic and intensive schools and approximately 100 of the Colorado peer schools. Schools excluded from the gap analysis had too few tested students who were ineligible for free or reduced-price lunch to report their disaggregated data. 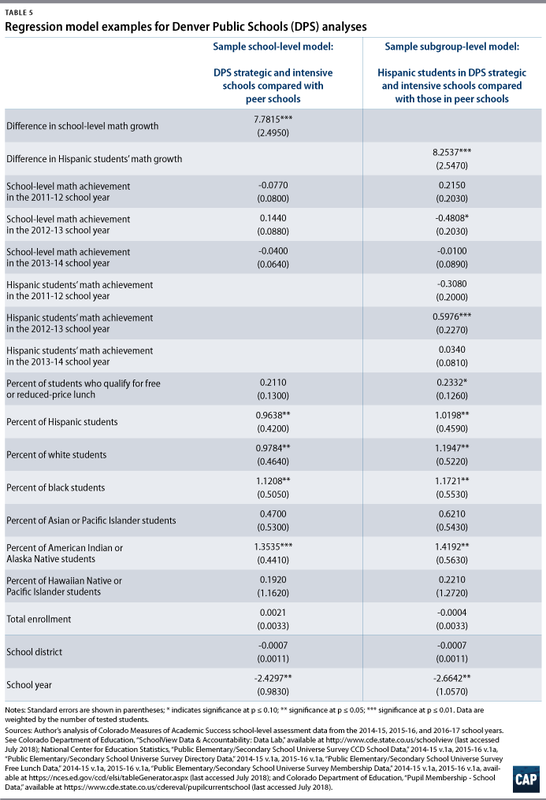 For similar reasons, there was insufficient data to compare achievement gaps by race and ethnicity. As states across the nation implement their ESSA state plans, districts must bring an extra focus on helping struggling schools make gains. To this end, districts can strategically deliver resources to schools by using an approach similar to Denver’s in order to better identify their needs. Importantly, districts should be intentional in including every school in their support system, promoting continuous improvement of all schools—not just those identified for intervention—and providing appropriate tiered supports. This method is a transparent way for the schools, teachers, parents, and other stakeholders to understand which schools receive which resources and why. However, given the real needs of struggling schools, districts should not lose sight of those schools that states identify for comprehensive or targeted support and improvement under federal law. Indeed, district attention is still needed for the lowest-performing schools—especially given the district’s responsibility to create or oversee school improvement plans. 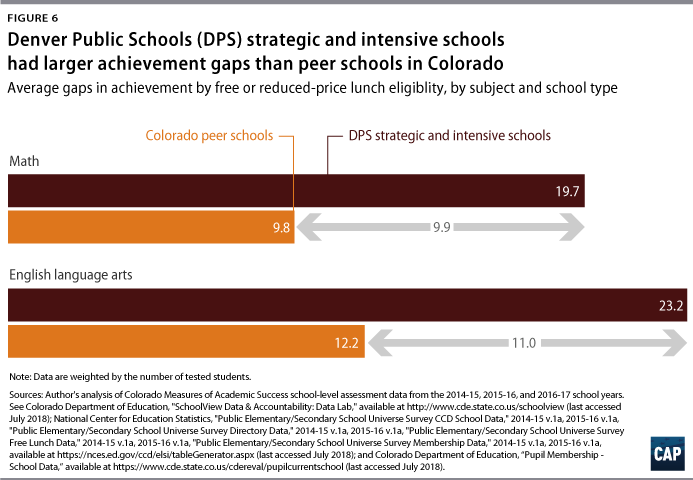 However, as Denver’s approach shows, targeting resources to the lowest-performing schools does not have to come at the expense of continuous improvement for all schools, and vice versa. Accordingly, district leaders and other policymakers should consider creating a framework that supports schools across the spectrum of performance while continuing to provide critical resources to schools with the most needs. To be sure, DPS gains cannot be attributed solely to its Tiered Support Framework, particularly given the multitude of reforms and improvement efforts that the high-capacity district has undertaken. However, the gains made by the entire district and by the schools receiving preventative or more intensive supports are suggestive of momentum in the right direction. Additional research on the Denver experience—particularly across school characteristics, such as school level and size—would help further illuminate how the district’s Tiered Support Framework may be a model for other districts as they support school improvement at the local level. 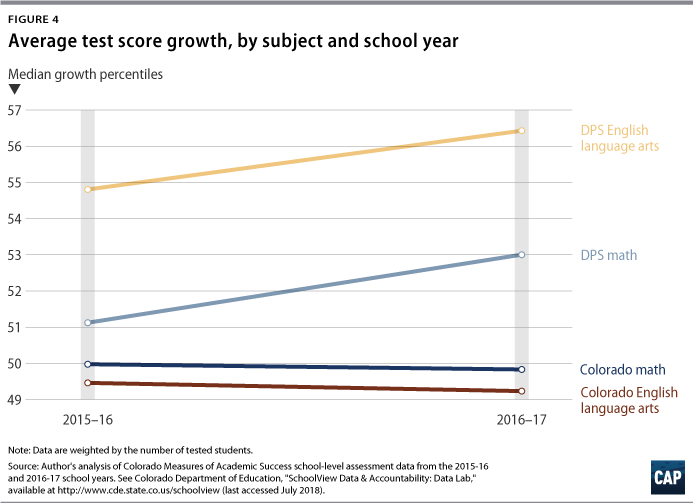 Overall, this analysis compiled several different sources of data, including Colorado state assessment data, school demographic data, and state and district school ratings data. 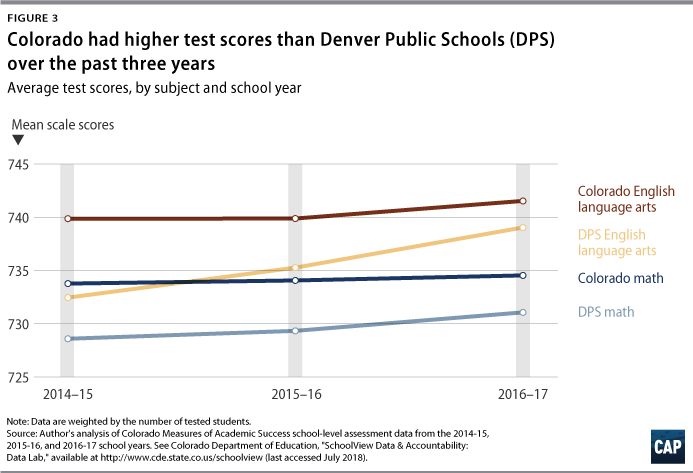 These data were used to analyze school performance during the 2014-15, 2015-16, and 2016-17 school years in Denver Public Schools, the rest of the state, and subgroups of schools within the district and state. 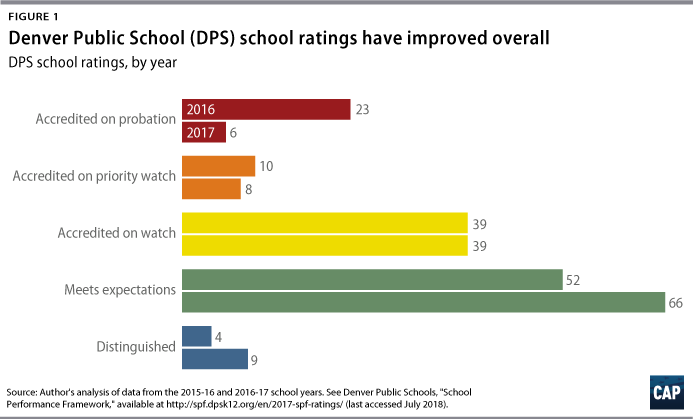 The analyses that compared DPS school performance with school performance in the rest of Colorado and that compared schools within DPS with one another included schools with data from the 2014-15, 2015-16, and 2016-17 school years. The analyses that compared DPS schools with peer schools across the state was restricted to schools with six years of data from the 2011-12 school year through the 2016-17 school year. 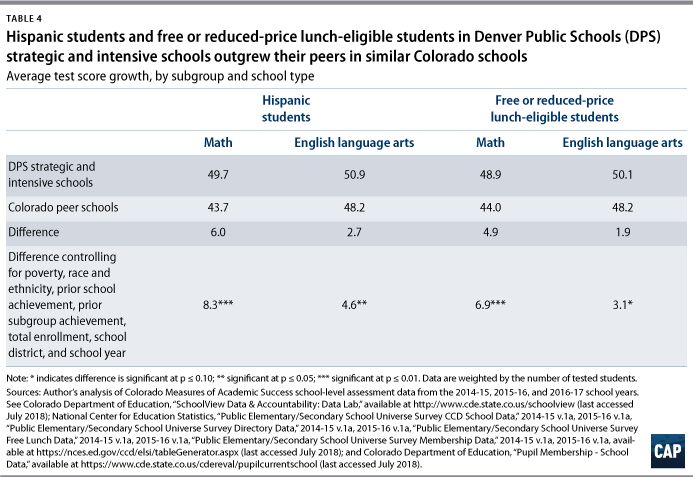 To create the Colorado peer group of schools, the author regressed the percent of students who were eligible for free or reduced-price lunch—a proxy for poverty—on math and reading achievement from the 2011-12 school year, controlling for the race and ethnicity of students, total enrollment, and school district, weighted by the number of students tested in a school and using robust standard errors. This regression model, which had high predictive power, was used to predict a school’s math and ELA achievement given its measure of poverty, controlling for the described variables. Colorado schools that had similar predicted achievement as the 35 elementary schools in the strategic and intensive schools group were selected for the peer group. 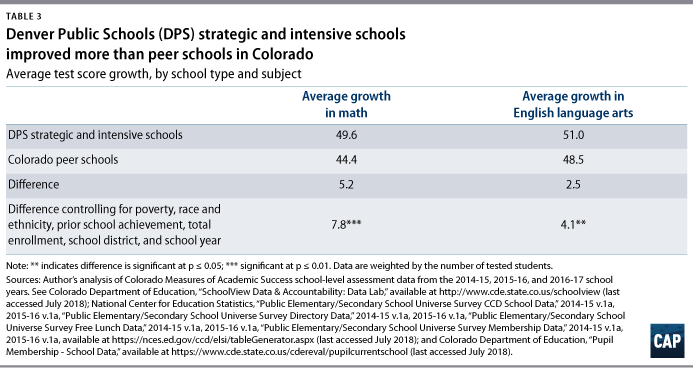 Analyses confirmed that, in the 2011-12 school year, the two groups of schools—the 35 strategic and intensive schools and the 117 Colorado peer schools—were similar in math and ELA achievement, poverty, and race and ethnicity. However, because there were more white students and fewer black students in Colorado than in Denver Public Schools during years analyzed, there were also more white students and fewer black students in the group of Colorado peer schools. Analyses also confirmed that, during the years in which the analysis compared their academic growth, the two groups of schools were similar on those same key data points. Additionally, the author collaborated with DPS’ Tiered Support Framework team on this report. As data analyses were based on the methodology described above, district analyses of school performance may differ. Samantha Batel was most recently a senior policy analyst for K-12 Education at the Center for American Progress. Her work covered a variety of topics, including school and district accountability; standards and assessments; school improvement and school governance models; school finance; school climate and culture; the school-to-work pipeline; and school redesign. The author would like to thank a host of individuals at the Center for American Progress who helped make this project possible: Erin Roth, the author’s favorite office mate, for her listening ear and generous feedback; CJ Libassi, formerly at the Center, for his instruction, guidance, and time; Rasheed Malik, a respected colleague, for his critical eye; Rob Griffin, also formerly at the Center, for his help during the conception of this project; and Scott Sargrad and Laura Jimenez, for their guidance and valued perspectives. Additionally, the author would like to thank the following individuals for their support and feedback during various stages of this project: Chung Pham, Lauren Durkee, Amy Keltner, Dan Melluzzo, Maya Lagana, and Ann Whalen from Denver Public Schools; and Dan Jorgensen, from the Colorado Department of Education.